Here it is 2 a.m. and I can't go to sleep until I'm done packing. Tomorrow evening, I head straight from work to a 6:30 flight out of SFO. I've worked really hard since September and I'm about to go on a well-deserved Christmas vacation. 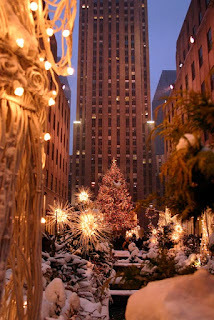 Everyone always says there's nothing like New York at Christmastime and they're right. Last year, I spent the holidays in Oakland and it wasn't miserable but it wasn't home. To be honest, it's not even the best idea for me to go home for as long as I'm going to be there. I've got major events coming up and lots to prep but at this point, I'd much rather be working long-distance. There's something about NY that recharges my batteries. No matter how hectic it is, I always return with an energy and vitality that I didn't have before leaving. Basically, I kill myself before leaving. I'm tired and cranky and out of it by the time I board the plane but when I get off, I'm ready to face the city that never sleeps. After all, that's where I learned how to live without it.